A New Orleans centered business from the very start, Gambino’s grew out of Big Easy traditions and a local’s home. In the early 1920’s Beulah Ledner began baking out of her uptown kitchen on Lowerline Street. Her treats became a fast favorite of Tulane and Newcomb students and faculty and grew both her name and her baking business beyond the four walls of her home and into a location on Claiborne. 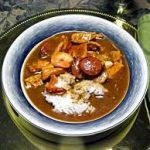 Known as the “Doberge Queen of New Orleans,” Beulah invented the classic Crescent City cake and became a baking legend. Her bakery made the perfect marriage in 1946 when Beulah decided to sell her retail location and recipes to a man named Joe Gambino. Gambino began operating the bakery, which remained named the “Beulah Ledner Bakery,” and stayed loyal to Beulah’s creations. His pastries and cakes quickly gained notoriety in New Orleans and in 1949 he decided to reopen the bakery under his name, thus becoming “Joe Gambino’s Bakery.” His uptown business quickly expanded, allowing him to open multiple locations throughout New Orleans, into the surrounding suburbs, and eventually spreading into southern Louisiana. Thriving through the end of the twentieth century, it wasn’t until 2005 that Gambino’s suffered a setback. Hurricane Katrina buried all of the New Orleans locations beneath ten feet of water and Gambino’s was forced to close several of their stores. But the Gambino name persisted through the devastation, reopening stores in Metairie and continuing to serve New Orleanians the cakes and treats they had become famous for. With almost 100 years of tradition, Gambino’s Bakery has kept craftsmanship and quality as its hallmarks. To this day Gambino’s bakes its pastries and treats fresh daily and it is Gambino’s alone that bakes by hand Beulah Ledner’s original doberge cake recipe exactly. 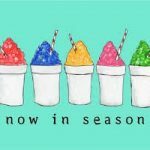 They have made New Orleans flavors and style accessible across the country and continue to bake with passion to make the best desserts possible. Our many options include King Cakes, wedding cakes, birthday cakes, doberge cakes, specialty desserts and so much more. Every cake has different options for flavor, icing, and decorative style; the possibilities are endless. Your family and friends will love every bite of the delectable taste of your choice. We're a family oriented business that is local to the New Orleans area. Celebrate your family traditions with the best of desserts. We have bakery locations in the New Orleans area of Metairie and Gretna, Baton Rouge, Lafayette serve all of Louisiana and the entire country with our products. Don't wait to get in contact with Gambino's Bakery and place an order for your favorite sweets and pastries! Beulah Levy Ledner, born into a Jewish family in St. Rose, Louisiana, opened a bakery in New Orleans in 1933. 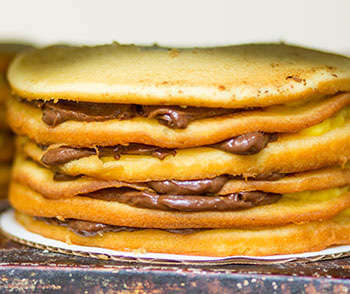 She became very successful after creating her "Doberge cake" adapted from the famous Hungarian/Austrian Dobos Cake, a cake made of nine génoise cake layers filled with buttercream and topped with a hard caramel glaze. The doberge cake is based on a recipe originating in Alsace-Lorraine. Ledner replaced the buttercream filling of the Dobos Cake with a custard filling and iced the cakes with buttercream and a thin layer of fondant. 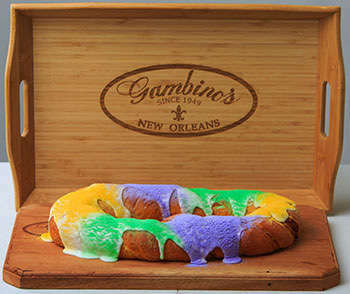 The "king cake" takes its name from the biblical three kings. In Catholic liturgical tradition, the Solemnity of Epiphany - commemorated on January 6 - celebrates the visit of the Magi to the Christ Child. The Eve of Epiphany (the night of January 5) is popularly known as Twelfth Night (the Twelve Days of Christmas are counted from Christmas Eve until this night). The season for king cake extends from the end of the Twelve Days of Christmas, up until Mardi Gras, or "Fat Tuesday;" the day before the start of Lent. Some organizations or groups of friends may have "king cake parties" every week through the Carnival season. Whoever gets the King Cake baby is expected to buy the next cake for these get-togethers. It’s believed the festivities of Carnival were brought to Louisiana by French-Canadian explorer Pierre Le Moyne Sieur d’Iberville. He led an expedition on behalf of the French crown and on March 2, 1699, he set up camp along the Mississippi River, 60 miles south of the present location of New Orleans. It just so happened the next day was Mardi Gras, and so began its celebration. The King Cake tradition is thought to have been brought to New Orleans from France in 1870. The official colors of Mardi Gras–created in 1872 by the Krewe of Rex–purple for justice, green for faith, and gold for power.